Mention Transylvania and it conjures up the image of a certain black cloaked gentleman with protruding eye-teeth. 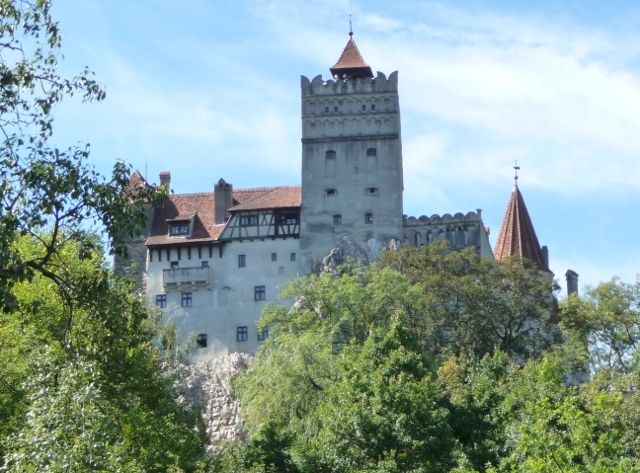 The Dracula we know and fear is largely the creation of Bram Stoker’s imagination, but the character is rooted in Transylvania, a land alive with folklore, including tales of vampires. Dracula has become interlinked, even confused, with the real historical figure of Vlad Ţepeş – in English, Vlad the Impaler. 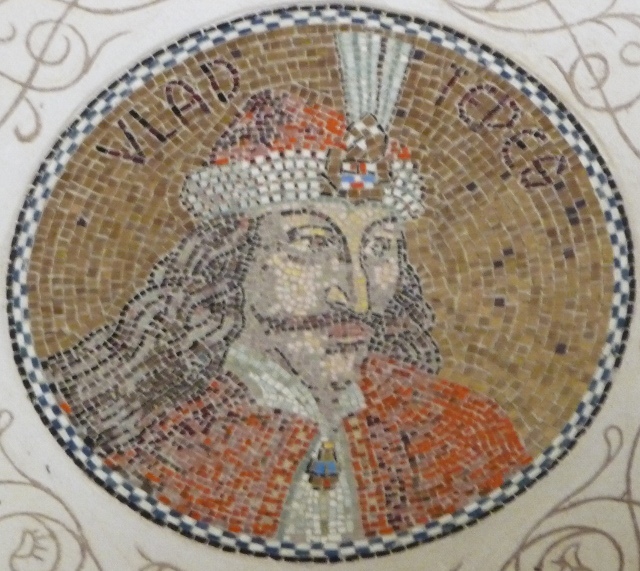 Vlad’s family name was Dracul after his father was inducted as a member of the Order of the Dragon – ‘drac’. ‘Dracul’ means the devil in more modern Romanian, and was ‘borrowed’ by Bram Stoker for his mysterious count. A prince of Wallachia rather than Transylvania, Vlad Ţepeş lived in turbulent times back in the 15th century, and became notoriously prone to impaling rather a large number of people as well as thinking up a whole range of grim tortures. There is nothing to suggest that he ever indulged in biting his victims’ necks though and he is thought of as a heroic figure. We’ll come back to those stories in later instalments, in the meantime, we entered the province of Transylvania, having stocked up on garlic, and found that there was so much more to it than Dracula, but he does keep the tourists coming. From Bucharest, we drove directly to Târgovişte, not yet quite in Transylvania, to see the Princely Court. This complex of buildings was where Vlad Ţepeş spent his early years, before being sent with his brother to the Ottoman court as hostages by their father. Later he would return, after the murder of his father and an older brother by Wallachian boyars (feudal lords). He waited a while to exact his revenge on the murderers, which he did by getting them half drunk at a feast before his men seized them and merrily impaled them on stakes around the town. He spared a few as he needed labourers for his castle at Poienari. It was a Monday though, and as we got closer I rechecked the guidebook and erm… like so many things but luckily not all… it was closed. Oh well, perhaps we could see the towers and so on from outside? Yes we got quite a good view, but the gate was open and we wandered in all innocence past the closed ticket office only to be repelled by a black clad security guard at the archway into the complex. He was very nice about it and let us take a few pictures. The buildings had been quite heavily restored and lacked atmosphere, so we weren’t overly disappointed at missing a more in depth visit. Targovişte’s other claim to fame in more recent history is its barracks where the Ceauşescus were killed in the 1989 revolution. 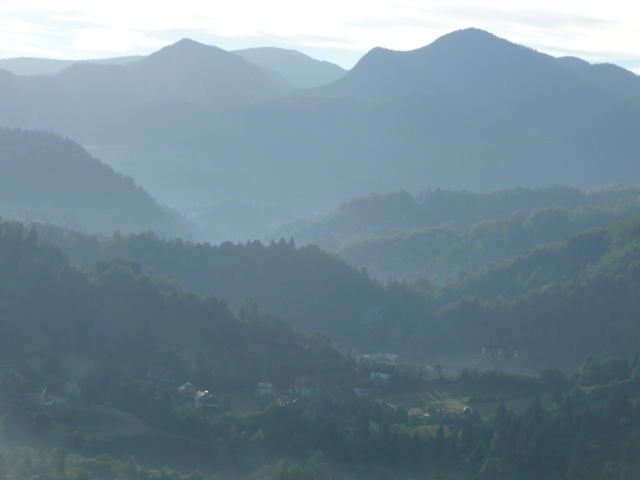 We were heading towards Bran and Braşov, and Câmpulung Muscel was sort of on our way. I read about a rock church in Nămăesti, a village just outside the town and not far off our route. We love a good rock church and this one was a gem, we parked below it, and dodging the begging Roma children by the gate, strolled up the hill. It was beautifully kept and among the icons inside in the gloom was a special Madonna thought to have healing powers. Câmpulung Muscel was a pleasant busy town, but it was the Negru Vodă monastery behind its impressive towered gate house and walls that we wanted to see. Under the gate house arch there was a pretty church and cloisters. Something was going on in the church so we skirted around and took pictures of the tower. As we walked past, a priest appeared at the backdoor and indicated that we should go through an opening in the wall towards what they call the hospital church, towards the rear of the grounds, minding a fierce dog on our way. Luckily the dog was nowhere to be seen and we admired the frescoes in the porch and took plenty of pictures. On our way back through, the priest handed us a couple of prayer cards with pictures of icons on them. We entered this church now, and were in awe of the incredible frescoes, admiring them to the sound of distant chanting. Time was getting on and we had a way to go to Rucăr where there was apparently a campsite. A few miles out of Câmpulung Muscel, we saw what looked like a lighthouse on a hill. The road wound round towards and by it. 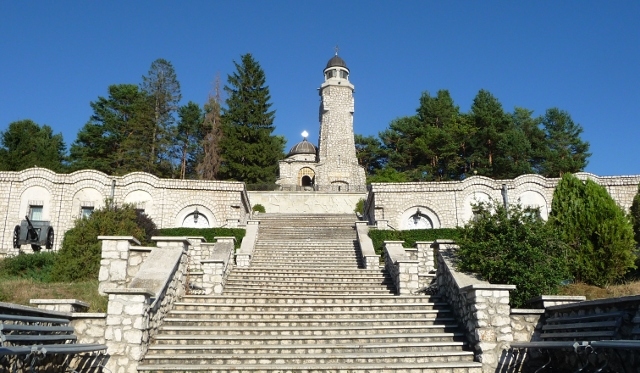 The Mateias Mausoleum is a World War I memorial, set high up flights of steps, the car park below had a few beat up cars, a couple of shack cafes and about thirty stray dogs milling about. Not terribly inviting, but the dogs luckily ignored us, and we made our way up. Half way up we were called into the museum by the friendly guardian. It was unexpectedly worthwhile, telling the story of how the Romanians held the Germans for 45 days in this area in 1916, with huge loss of life. There was a very clever recreation of a hillside trench in one half of the building, you felt as if you were there amongst the men fighting, and you could hardly see the join between the foreground three dimensional set and the painted distant landscape. While we climbed the rest of the steps up to the monument itself, something set the dogs off into a cacophony of barking, what a chorus! Inside the building soldiers and religious figures were portrayed in gold and colour mosaics as well as national heroes, including Vlad in the image shown earlier in the post, downstairs there was a chapel and ossuary where remains of around 2000 men are kept forever. Rucăr bore no sign of Camping Panorama, it was flat on the valley floor too, but luckily I had for once written the street address. It was 219 on the road we were on. We drove out of the town the other side and the numbers weren’t even close. It was several more kilometres and quite a few metres higher into the hills, when we spotted the campsite on a bluff above the road – mainly because there was another T25 parked up there. The view across the valley was stunning as we settled into our pitch in the Dutch run site, made friends with the Germans in the T25, and enjoyed the last few rays of the sun. We are still experiencing hot days, but up in the hills the nights are now quite cold. Next day hills and valleys and more views on the road to Bran, home of ‘Dracula’s’ castle. 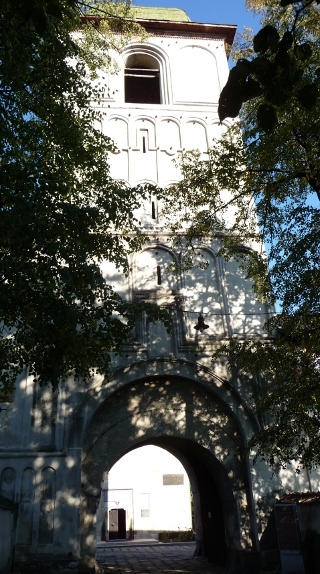 Well, Vlad Ţepeş may once have besieged it. It is suitably dramatically situated high on a rock above a narrow gap in the valley, all turrets and towers. You can see how the imagination worked over time in the continuation of the Dracula myth. 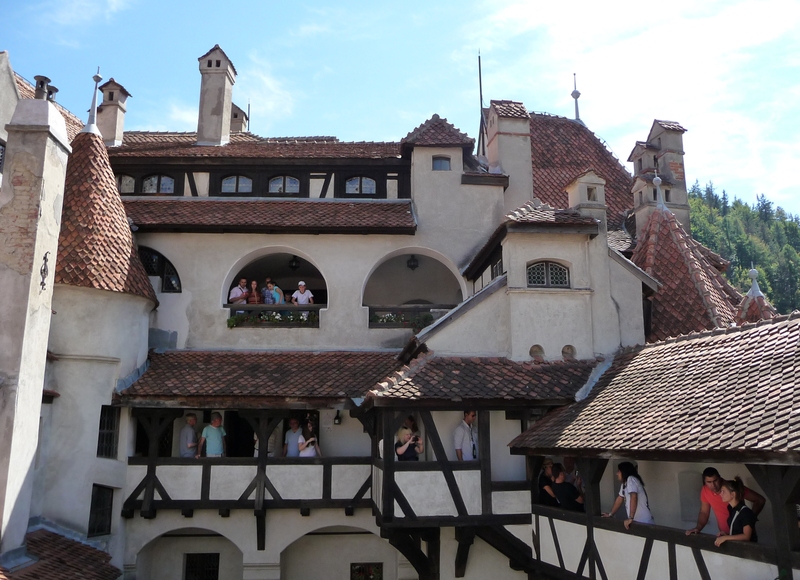 It was originally built to protect the trade route through to Braşov back in the 13th and 14th centuries. 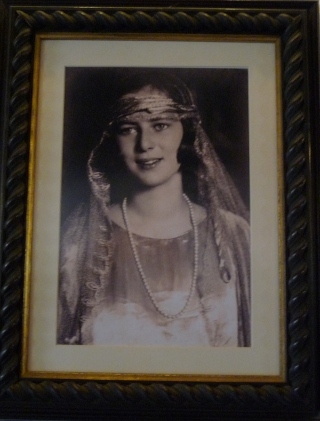 Nowadays it is the presence of one of Bran’s later residents – Queen Marie of Romania – that is felt. It is a castle that you can see yourself living in, with stairs and passages up and down and every which way – the kind of house I always dreamed of as a child. Queen Marie is an immediately inspiring figure, a granddaughter of Queen Victoria who married Prince Ferdinand, the nephew of Prince Carol I of Romania in 1893. She evidently embraced her new country wholeheartedly (if not her husband), becoming the ‘voice of Romania’ at the Paris Peace Conference in 1919. She was not only stunningly beautiful, but artistic herself and a patron of the arts. She nursed sick soldiers in the Balkan and 1st World Wars and won the hearts of Romanians. 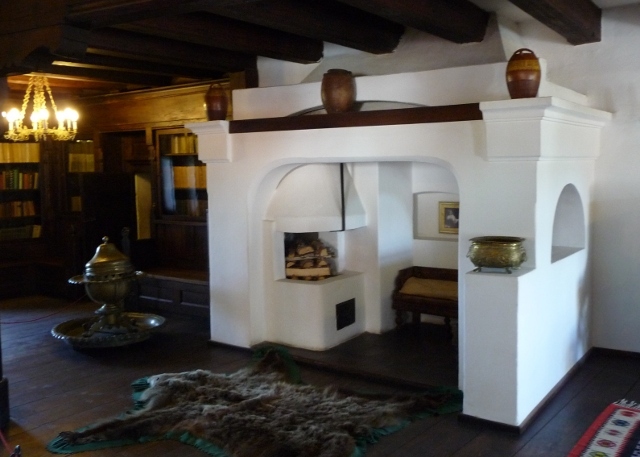 Bran castle is furnished in what would have been her style, simple and elegant. Obviously over time, her children inherited the castle, but then it was confiscated under Communism and they fled Romania for the States. It was open to the public, but in 2009 it was finally restored to the family again, Marie’s grand-children, who formed a company to run it and keep it for the public to visit. To serve the Dracula myth, there are a couple of upstairs rooms with useful information boards about Dracula, Vlad Ţepeş, vampires and Bram Stoker. The small exhibition of instruments of torture was closed though. Down in the town it’s a different story – stalls galore with all the tat you can imagine and people dressed as werewolves to scare teenage girls into a frenzy of giggling. All would have been perfect if we’d only have had the place to ourselves! 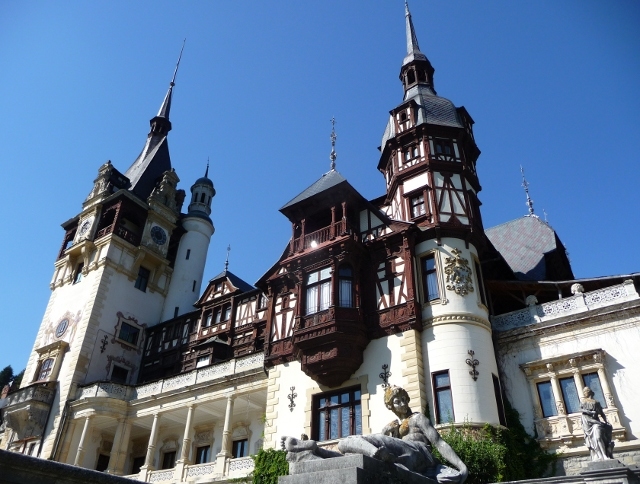 Before heading to Braşov, we backtracked south again a bit further east to see Peleş Castle at Sinaia (no Vlad or Dracula connection). This castle had been in Ceaucescu’s thoughts when he was planning his mammoth palace in Bucharest, and it was commandeered as a residence for the president for a time, but has now also been restored to the descendants of the royal family. Built in the 19th century, it resembles a Bavarian castle, and is set in parkland like an English country estate. The entry fee to get in was about £5 each – but to buy a permit to enable you to take photos inside would have cost us an extra £7. We were getting used to the Romanian ‘tax’ on taking photos which seems to be a common practice at a lot of sights (thankfully not Bran Castle though). This was extortionate. We waited for a tour in English, and were barked at to put on over slippers – not the plastic throwaway kind, but proper slippers from a pile of mismatched grubby and worn out slippers… Then barked at to follow the guide, who it turned out was rather soft spoken and not easy to hear. Adrian got caught out and reprimanded for trying to take a sneaky photo or two (she could be heard by everyone then!). The interior is impressive, lots of wood panelling and carvings, but heavy and over ornate after the simplicity of Bran. Neighbouring Pelişor castle might have been more to our taste, smaller and with art nouveau interiors, but this was closed on Tuesdays and Wednesdays. This entry was posted in Art & Culture stuff, By Country - Romania, Travel stuff. Bookmark the permalink. The people at Peles sometimes bark at tourists (for some strange reason), but the beauty of the castle compensates their rude behavior.